De Cesaris was a former World Karting Champion who served his car racing apprenticeship at the age of 18 in a Formula 3 Ralt during the 1978 British Formula 3 Championship campaign. He made his F1 debut in an Alfa Romeo in the 1980 Canadian Grand Prix. That same year he joined Ron Dennis's Project Four organization for a program of Formula 2 before he was promoted into the newly established McLaren International ranks to partner John Watson in the following year's Formula 1 lineup. Unfortunately de Cesaris never managed to shrug off his erratic streak, punctuating his first full Grand Prix season with a succession of accidents and incidents. In 1982 he switched back to the Alfa Romeo factory team where he qualified on pole position at Long Beach, was then overtaken by Niki Lauda's McLaren and eventually hit the wall while running second. He stayed with Alfa in 1983, leading the Belgian Grand Prix at Spa-Francorchamps before retiring, after which his career went into a gentle decline with spells at Ligier (1984 and 85), Minardi (1986), Brabham (1987) and Rial (1988) before he spent two seasons driving the Scuderia Italia Dallaras. Just as it looked as though the waters were closing over de Cesaris in Formula 1 he was signed to lead the debutante Jordan team in 1991 and came close to bagging second place behind Ayrton Senna's McLaren at Spa. 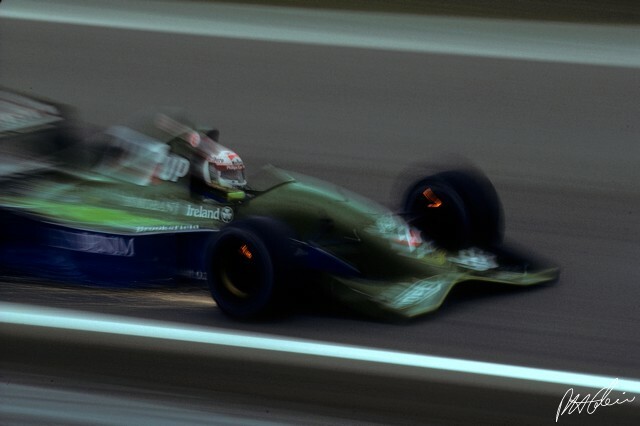 In 1992 and 93 he earned a reprieve with the Tyrrell team and then had two more races for Jordan in 1994, standing in for the suspended Eddie Irvine, before moving to the Sauber-Mercedes squad as replacement for the injured Karl Wendlinger. By the end of his Formula 1 career he had driven in 208 races with a couple of second places (Germany and South Africa in 1983) as the best results on his score card. After leaving F1 he became a currency trader but spent most of his year travelling the world windsurfing. De Cesaris was killed in a motorcycle street accident in Rome in October 2014.